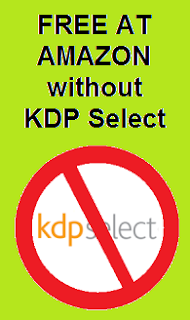 The only officially sanctioned method of pricing an ebook to free in the Kindle store is for authors to enroll their books in KDP Select, an optional program that requires exclusivity. Exclusivity is great for Amazon, but it's not so great for indie authors who want to maintain their independence and build a diversified revenue stream and readership across all retailers. Amazon allows KDP Select books to be priced at free for only five days per quarter. That's not enough time for authors to take full advantage of the amazing promotional magic of free. Every month I meet writers who think the only way to take advantage of free at Amazon is to enroll in KDP Select. Not true. If you know writers operating under this mistaken belief, please share this post with them. There's another, better option, and it doesn't require exclusivity. Smashwords and our retail partners can help. In this post, I'll teach you a trick veteran indie authors have been using for several years to do free and perma-free ebooks at Amazon without exclusivity. It's a way to turn Amazon's price-matching robots against Amazon. As you'll learn below, authors who avoid KDP Select can make greater use of free than those who are trapped in KDP Select. 1. At your Amazon KDP dashboard, price your book to $.99. 2. At Smashwords, price your book to free. 3. Within hours, iBooks will reflect the new price of free, and B&N and Kobo will follow within 1-2 business days. Next, visit your book page at Amazon and click the link under the "Product Details" box labeled, "tell us about a lower price." There, you or a friend can click the button beside "Website (Online)" and report that your book is available for free at another retailer. In that form, provide Amazon a direct hyperlink to one of the Smashwords retailers. A link to Apple or B&N is a good bet. I don't think they'll price match against the Smashwords store. See the screen shot below. Notes on the above: A. If your book is priced $2.99 or over and enrolled in the 70% royalty rate and you price at free elsewhere, Amazon will send you one of their lovely fire-and-brimstone emails where they'll threaten to kick you out of KDP for your transgression (the 70% royalty rate requires you not price your book lower elsewhere). But books enrolled in the 35% royalty rate (automatic for 99 cent books) don't get the nastygram because price parity elsewhere is not a requirement. B. Some authors ask friends or fans to report their books. I don't know if it makes a difference. C. Note that Amazon operates about 13 different stores, so you may want to report the book separately at their largest English-language stores (US, UK, Canada, Australia) to encourage price matching in each store. 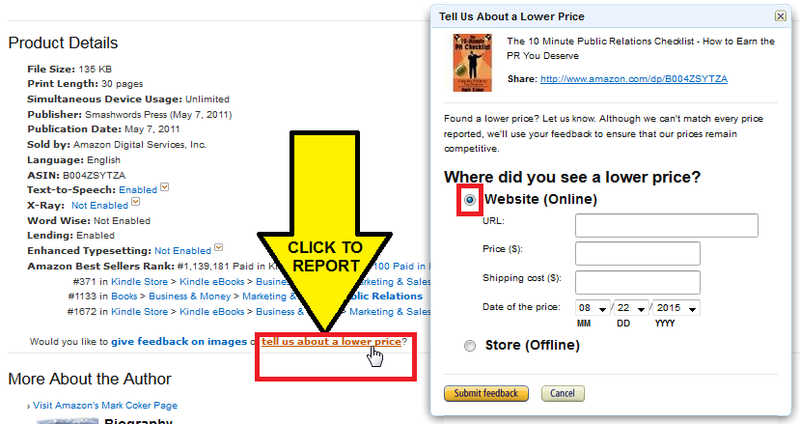 D. Amazon will often price match even if you don't do the self-reporting. E. Sometimes Amazon will not price match, even if you or a reader report the lower price elsewhere. They know indie authors use this trick to gain better control over their pricing. WHY SHOULD YOU PRICE AT FREE? Every author is well-served to experiment with free - either with temporary free promotions or with permanently free (aka perma-free). Why? Because free builds readership, and some of those readers will fall in love with your writing and purchase your other books. Free turbocharges your readership by eliminating the financial risk a reader takes on an unknown, untrusted author (and that's you until they know and trust you!). Free allows the reader to read you risk-free, and gives your writing a chance to earn the reader's trust and admiration. I've been promoting the use of free ever since we launched Smashwords in 2008. Smart use of free has catapulted many Smashwords authors to the bestseller lists. At iBooks, free books get 41 times more downloads on average than books at any other price. If you write series, definitely price your series starter at perma-free. Why? Because series with free series starters earn more overall sales than series without free series starters. About 65% of our top 100 bestselling series over the last 12 months have a free series starter. Here's more data on the effectiveness of free series starters: For the Smashwords 2015 Survey, we added up the sales of our top 100 series with free series starters and then compared that to the aggregated sales of our top 100 series that don't have a free series starter. The group with free series starters earned an average 66% more than the the group with priced series starters. I also looked at the median increase to rule out the possibility that a couple mega bestsellers might have skewed the numbers. The median was also 66% higher for series with free series starters. Exactly the same. Free series starters also open up the possibility of earning merchandising features at the retailers, particularly at iBooks. iBooks does more to promote free than any other retailer with their regular "First in Series Free" promotions. Last week, iBooks launched a "Rising Stars in Romance" feature in their Australia and New Zealand stores featuring the free series starters of Australian and New Zealand authors. Even authors who only publish standalone books can benefit from free. For many first-time authors, one of your biggest challenges is to get your first readers and your first reviews at retailers. Free builds readership and can help you establish your first reviews at the major retailers. Or, if your book has been out a long time and sales have dwindled, try a temporary free promotion to rev up readership, reviews and word of mouth. If you have a standalone book on preorder, you can price another standalone book at free to drive up readership, and then use the backmatter of that free book to advertise your preorder (at the end of every book, you should provide a listing of your other books). Free is not a guarantee of readership. A few weeks ago I received an email from a Smashwords author who priced his books at free yet he was still struggling to attract readers. The reason: there's a lot of competition out there. Smashwords authors and publishers publish over 55,000 books at free. Although free is a powerful catalyst for building readership, free works best if your book is a super-awesome WOW book that turns the reader into a evangelist. WOW books average 4.5 to 5 stars out of 5. Just because a book is free doesn't mean the reader will read it or finish it. On the contrary, they're probably less likely to finish a free book if it doesn't hold their attention on every page. Bottom line, if you want to turn a free downloader into a paid reader, you must earn the reader's awareness and trust. It's classic PR 101. First build awareness, then build perception. Free helps the reader become aware of your writing. Perception is formed based on the true merits of the product. Beyond the power of free to get readers to take a chance on you, there's a lot more you can do under the umbrella of best practices (free is only one of many best practices). To learn more about best practices, check out my presentation deck, How to Publish Ebooks, or download my free ebook, The Secrets to Ebook Publihsing Success. Also check out my recent blog posts, Ebook Publishing Gets More Difficult from Here - Here's How to Succeed for additional ideas on how to reach more readers. Yeah, I did this years ago and Amazon still refuses to price match it. I move about a book a day at Smashwords and ... get a LOT of returns at Amazon. I had a perma-free ebook for a couple of years using this method, and it did wonders for my other ebooks. As long as you have enough books published to allow you to use one as a loss leader, it it well worth trying. The other thing with Amazon is getting them to stop price-matching when you want them to. I gave away eight hundred copies of a story, (and it's getting harder and harder to give books away), and by the time we got a price on it, it was days later and it was essentially useless. That being said, as an unknown author, low prices and free products are powerful tools because they don't cost anything out of pocket. I've distributed over 100,000 ebooks. At 35 %, that' $35,000 in advertising...money which I don't have and will never have as long as I'm just some old guy on a microscopic disability pension. I find pricing at $0.99 on Amazon first then going to Smashwords to put the book at free works best for me. Amazon's been price matching my books since 2011, if I remember right. This is the method I used each time when I wanted another book to go free. I know a couple authors who've been unable to get that system to work, even when they have others alert Amazon of the free price. I don't know why they have this problem when it seems automatic to others. Free, especially for series starters, has been the best marketing tool I've ever used. My strategy is to plan out a 3-4 book series. My first book will stay at $2.99 until I get to book 3. At that time, I'll either do $0.99 or free. If the series is done, I'll most likely do free. If it's a 4-book series, I'll probably do $0.99 for the first book. Then, after book 4 is out and sales bottom out, I'll drop it to free. The boost in sales isn't always a high one, but it definitely seems to make sales more steady and predictable. It's certainly been better than if I hadn't done it. If I want to discourage sales, I keep the first book in the series at the original price point, and that method has worked great. So from my experience, sales go up overall for the series when I price the first book at free. I do not run sales on my books, and I don't change the price of the other books in the series. Some authors do these strategies, and it works well for them. It's not my preference. I like using the first book in a series at perma-free instead because it is cost effective and it's long-lasting. I write historical and contemporary romance, and this method seems to work pretty well. Also, getting more an average of six books out a year helps, too. The more books you have, the easier it is to utilize perma-free. Any author can e-mail Amazon through KDP Help and ask for a price match. It's the only way to guarantee it happens. The price will change within a day of them receiving the request. 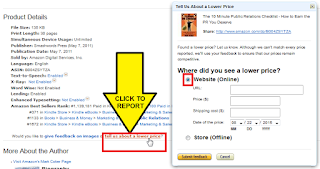 Don't rely on reporting the lower price on the book page, or for Amazon's bots to notice. You'll wait weeks or months for a change, if ever, nowadays. If you're publishing through Nook Press, B&N doesn't price match to free -- at least not in all the times I've tried it. If someone knows how to get Nook Press to price match free books, I'd love to know, especially since I'm a Nook owner and hardly ever buy from Amazon. I have a lot of Nook followers and would like to give them the chance for free directly. Thanks for posting this! I've done a lot of research regarding this market and somehow missed this! I had a book at $2.99 on Amazon and it was listed free elsewhere without my knowledge by B&N, and I got a threatening letter from Amazon. Now I understand how other authors are doing it. I am going to employ this tactic on all my first book of the series and see what happens. I am now selling more books through Smashwords outlets with my 36 books. @Ruth, thanks as always for sharing your smarts and experience. @Terry, Amazon's the only retailer that makes price-matching a standard business practice. If you want to price at free at B&N, this is one of the many advantages of distributing to B&N through Smashwords as opposed to going direct. Smashwords-distributed authors can price at free at B&N, you'll earn 60% list on books priced $.99 and up (vs. 40% list going there direct for under $2.99 or over $9.99, and 65% list for $2.99-$9.99), not to mention you'll save a time by consolidating your distribution. B&N is also now faster than ever processing new listings, preorders, assetless preorders and metadata changes (usually 1-2 business days from our delivery). Thanks, Mark. I know I can get free pricing using an aggregator, but your article made it sound like B&N would price match a Nook Press book free once you priced it free at other channels. Thanks for clarifying. I do like Nook Press's WYSIWYG editor for fixing minor glitches, something Smashwords doesn't offer yet. and pulled the amazon stuff after. It didn't contain anything I didn't know already, but it still gave me that last shove I needed to finally decide, once and for all, that I'll make the first book in my current series perma-free when the third book comes out in a month or so. Just reporting a lower price isn't enough anymore. I used the report a lower price feature and had a dozen friends report it too with no result, so I contacted KDP's support staff to report that my book was free elsewhere and that finally did the trick. I'm writing a series of Collin Roggero adventures, so I'll try permafree for "Legacy once "Royal Venom" goes live at retailers, and will use 60-day pre-order strategy for launching "Royal Venom. Tried 99-cents for "Legacy" with very little success. Since 2010, when I joined Smashwords, all my short stories have been and will be perma-free in the hopes of creating and growing a fan base. This strategy has been modestly successful for generating sales of my priced novels. Good luck, everyone. I'm waiting for the day when Mark C will have his folks create a translation engine that will allow the reader to purchase a nearly real-time machine translated copy of my titles in Smashwords. Sure, nuances and slang will be gibberish for a while, but authors will gain instant access to millions o' readers and potential fans. Pricing the first book in my two series has made such a huge difference in sales. I was beholden to Book Bub for the longest time to sell any books until I took advantage of the perma free idea. It gives me control over promoting. Thank you! Great article. You can also go through your dashboard and contact them directly with an email - but they may or may not match the pricing. They did right away on two of mine and on the third they sent me a snippy note that said pricing was up to them and still haven't changed it. I'll try again in a month or two. Having the first book free really is a great way to get readers! This didn't work for me. I tried it a couple of years ago, and notified Amazon, but they still kept my short story at 0.99c. I now have all 10 of my short stories free on Smashwords, but they're not free on KDP. Jason Kong, I think it was, had a way he swore worked, but it involved contacting each of the stores where KDP had the book up. Danielle how's it working for you to have all your short stories free? Suzanne, Sorry, but I'm not sure about the meaning of your question. Amazon never matched the free pricing on SW, if that was the query.If you mean, how many people downloaded them, I haven't checked lately, but I suspect not that many as the stories had been up on Smashwords for over a year before I made them free. If you meant, did it send readers off to buy my novels, I'd have to guess No, as unfortunately the only novel I currently have out is in a very different genre from that of the short stories. Thanks so much for your query, I hope I've answered it. I've tried this for several books and get nastygrams from Amazon threatening to terminate my account. As I have over 900 books for sale through Amazon and make a lot of money on their site monthly, I'd rather continue to earn the paychecks I do than take the chance on moving a few freebies here and there. When my authors complain, I tell them to open their own KDP account and upload their free books themselves. It's a sad fact that I can't get my own free books on Amazon, but that's a double-edged sword. I'm more miffed at the moment by Amazon's practice of allowing returns. That's hurting me right now. People pay for an ebook, read it, and return it within a week for a full refund and I don't earn squat. That's crap. In May, after much soul-searching, I made the first book in my series permafree. This series currently has 4 books published, with the 5th and final book already on preorder and releasing in February 2016. I am so glad that I took this leap. In the months since my decision, I have generated more sales of the non-free books than ever before, across all platforms. My tactics for getting it free at Amazon were similar to those that have been mentioned in this post and the comments. I too noticed a very quick price change at iBooks, Kobo and B&N. B&N went to a 1 cent price for a hot minute, but was down to free fairly soon after. Amazon dragged their feet a bit, even with myself and some of my friends reporting the lower price elsewhere. I got tired of waiting and searched the internet for tricks on getting Amazon to price match. I stumbled upon advice to distribute to Google Play as a freebie. I know that some authors have expressed concern that Google Play does not have as many safeguards in place to prevent piracy, but as my first book had already been pirated and was now permafree anyway, this wasn't an issue for me. So I uploaded it to Google Play and within hours of it going live, Amazon matched the price. I'm not sure if it was a direct result of Google Play, or if it was just my book's turn in the Amazon algorithm, but it's worth a try to those who are having problems. I've just discovered Smashwords and I love everything you are doing and saying! There's a 'publishing' typo in your last paragraph. Does anyone have experience with international markets? It looks like Amazon price matches in the U.S. market, but not necessarily in other markets. Any suggestions? Thanks! I tried to price match to free earlier this year. For the Amazon.com store it was no problem, but they won't always price match at their other stores. I've been too lazy to pursue it, and will be going back to paid soon. Also B&N/Nook won't make a book free. I emailed them about it and they just said that it's not a thing they do (despite the competition). You have to go through a distributor. There's a Goodreads thread specifically for seeking help in getting this price match to happen. It's at Smashwords Authors/Marketing. Hi Amelia, you just hit on yet another reason to distribute everywhere with Smashwords (in addition to the time savings, simplicity, aggregated same-and-next-day sales reporting). Also at B&N, note that you're only saving 5% list for $2.99 to $9.99 books, and if you ever do sub $2.99 promotions or plan to $9.99+ (like with single-author box sets) we actually pay more. Quick Question aboout this. IF I enroll the book in KDP Select and use the 5 day free period BEFORE asking for price match by offering the book for free on Smashwords...would that be a problem? I mean, it seems to take some time to get approved for premium distribution with Smashwords, and I want to get started with some promotion for the first book in my series. Hope someone can help even though this is a old thread! Hi Tom, the point of this post is that you can do more with free **BY STAYING OUT** of KDP Select. KDP Select only gives you 5 days of free per quarter, and it requires that you make your book exclusive to Amazon. If you instead get Amazon to price match against our retailers, you can benefit from free or permafree for as a long as you choose. Price changes at Smashwords are rapid. Once you make a price change in your Smashwords Dashboard, you can expect to see it updated at Apple and Kobo within an hour or two, and within one to three days at B&N. Thanks for this article. This process is truly overwhelming!! I am a baker/blogger who just published my first ebook. I want new subscribers to my blog to get it for free, but I want it to also be available for purchase (thinking 2.99) for others. Do people do this?! I could give a free pdf download to new subscribers and have prices on Smashwords and Amazon? Help! Renee, click to your Dashboard's Coupon Manager screen. You can use that to give away free copies. Doesn't Amazon still charge a transaction fee though? Things, there's no transaction fee for free downloads. Good question, though. there is still a drawback if one wants to offer a free book on Amazon: before publishing anything Amazon wants you to fill a complete American fiscal request (W8).... which is a real pain when you are an European citizen who has traveled often to the US! So to be clear, do we "opt-out" our book distribution to Amazon at SmashWords and seperately load it at KDP? And then price match to the free book listed at apple or B & N? It would be great somehow for SmashWords to automate this for us so we can submit to Amazon via SmashWords. Mark, what do you think are the chances that Amazon changes and allows books to be priced permanently free on its platform? Mike, my guess is unlikely. As much as they say they want to provide their customers the lowest prices, they've never liked free and have chosen to use it instead as a limited perk to make authors go exclusive.